Update: The Palm Desert Police Department is requesting the public’s assistance in locating the sexual assault suspect. The Palm Desert Police Department is requesting the public’s assistance in locating the sexual assault suspect. 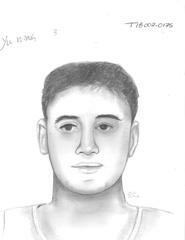 A sketch of the possible suspect is depicted below. Anyone with information is encouraged to contact Investigator Chad Martin at the Palm Desert Station at 760-836-1600. On Tuesday, January 2, 2018, about 9:19 PM, officers from the Palm Desert Police Department responded to an unknown trouble call in the 74200 block of Highway 111 in the city of Palm Desert. Officers arrived within minutes and learned a male entered a business at the location and attempted to sexually assault two employees. The victims fought with the suspect inside the business and exited the backdoor of the business onto Alessandro Drive, where the assault continued. The suspect fled on foot westbound on Alessandro Drive. Officers conducted an extensive search of the area and were not able to locate the suspect. The suspect is described as a dark skinned male adult in his early 20’s, 6 feet tall, 200 pounds, with short black hair, unknown eye color, wearing a dark vest over a dark colored t-shirt, blue jeans and white tennis shoes. The Palm Desert Police Department is committed to the safety of the citizens of this community and will be vigilant in investigating all crimes of this nature. The investigation is ongoing and we are reaching out to the public and asking anyone with information about this incident to contact Investigator Chad Martin by calling the Palm Desert Station at 760-836-1600 or by calling Crime Stoppers at 760-341-STOP. Tips can remain anonymous.